Massel bouillon cubes are made from a unique blend of vegetable ingredients, and are the easiest, most versatile way to add sensational flavor to soups, stocks, risottos and other home-cooked favorites. Made with all natural ingredients, these vegan bouillon cubes are animal-free, do not contain any added MSG, are free of onion and garlic, and are also gluten-free as well as Kosher. Available in 3 varieties – Beef Style, Chicken Style, and Vegetable. Each 1.23 oz. (35g) package contains 7 bouillon cubes. $0.99 per package. From Anonymous of Mt. Carmel, Illinois on 3/30/2014 . 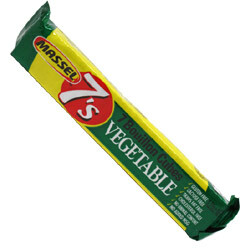 We use Massel Vegetable cubes in everything! Our local store discontinued the product about 6 months ago so we bought their entire stock. We are down to 5 cubes and are frantic to find more! I'm so glad I stumbled onto this site. Try and see and you'll like it. From Winston of Bloomfield Hills, Michigan on 9/7/2012 . Wonderful product.Excellent for making soup for noodles,Chinese style. From rebk4jc of New York, Unknown on 6/19/2012 . From Dixie of Aurora, Missouri on 3/4/2011 . From Mara Sachs of New York, New York on 7/10/2010 . Massel Bouillon Cubes and Powder are by far the best vegetarian bouillon I have ever tasted. Not only do they make excellent bouillon and soup stock, they are delicious for seasoning all kinds of foods. In the past, I have had to order Massel's products from Australia, so I am thrilled that VeganEssentials now has them!